Have you dreamt of leaving everything behind, swinging your leg over a motorcycle and riding off into the wind? Well, meet Jay Kannaiyan who did just that on a grand scale. Jay’s roots are from the Chennai area, but with an early childhood in Zambia while continuing to school in India, home was a very fluid concept from the get go. He then went to the US to study engineering and landed a job in Chicago. But the two-wheel itch that started in college manifested into a full-blown motorcycle touring lifestyle that saw Jay ride through vast tracts of North America, taking in Alaska, Canada, most of the US and even Mexico. It only seemed logical to continue riding and experiencing a life on the road. In March of 2010, Jay quit his job, sold his house, car and most other worldly possessions and set off on his 1998 Suzuki DR650, which he affectionately calls sanDRina. With only whatever would fit on his bike, Jay hashed out a rough plan of riding overland back home to India via South America, Europe and Africa. The 3 year and 3 month journey saw Jay ride a 103,200 km through 33 countries and using up 48 pages across 3 passports. sanDRina went through 17 oil changes and 6 sets of tires. Jay started the trip with an old bike because he knew that all bikes would breakdown at some point on such a long journey and it made sense to ride a bike that was simple enough to fix by the roadside. sanDRina is a very capable dual-sport motorcycle and being carbureted, air-cooled and lacking fancy electronics, she was very easy to maintain and repair. Jay rode through some very remote parts of our planet, such as across the Amazon rainforest, the vast emptiness of Patagonia, the deserts of Sahara and The Namib and the epic Himalayas of Ladakh. He feels at home when surrounded by grand nature and loves to connect with the people who are living off the land. 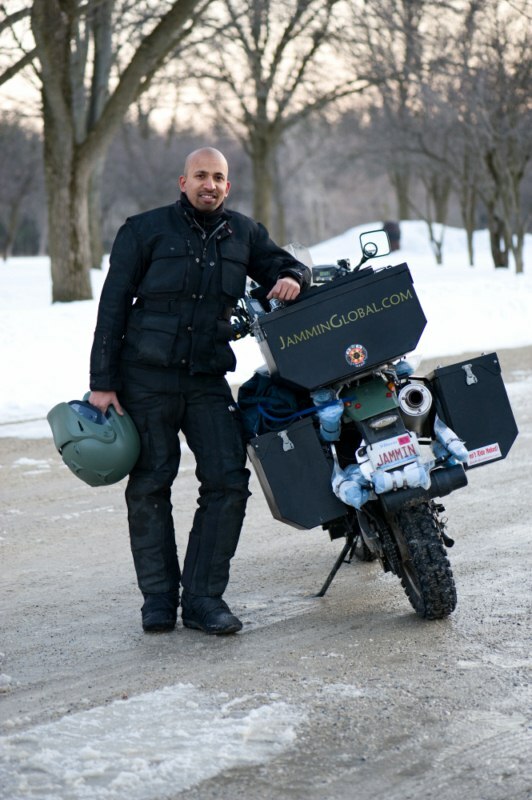 In March 2014, Jay launched Jammin Global Adventures Ltd to share the joy of adventure motorcycling with others via guided motorcycle tours in some of the best places he rode through and some new destinations. Get in touch with Jay to see about experiencing Peru, Kenya, Mongolia, Myanmar, Sri Lanka and India on a motorcycle – the best way to experience a land and its people!